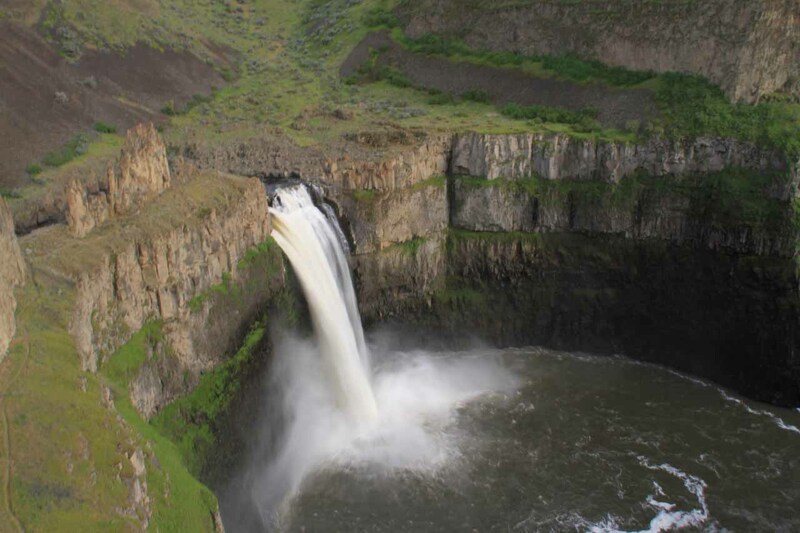 Palouse Falls took our breath away when we gazed upon its powerful flow amidst a rugged and naturesque canyon that very much reminded us of the raw scenery in Iceland. Except in this instance, we were in a remote corner of southeast Washington. Indeed, it was that combination of nearly unspoilt scenery combined with a quality waterfall that further reminded us of how beautiful waterfalls could be when left alone to Nature. 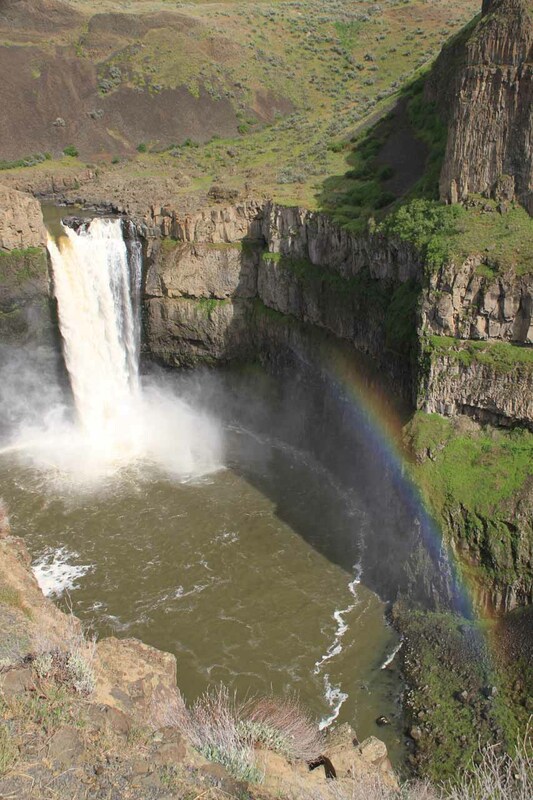 Even though this waterfall was said to be only 180ft tall, it had a power that threw up enough mist to produce rainbows. 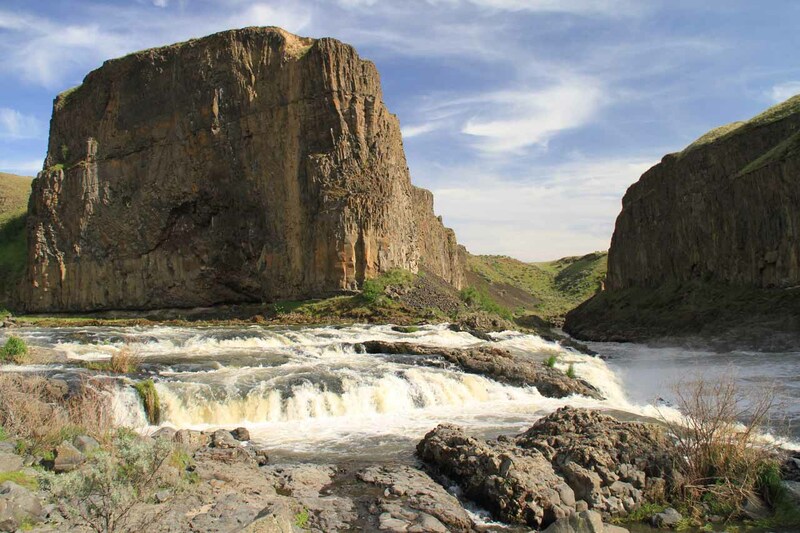 In fact, the Palouse River, which was responsible for this falls, was the geological legacy of repeated glacial dams and floods (especially the Great Missoula Flood) from the Ice Age. It was said to be the only year-round waterfall that resulted from this turbulent history. 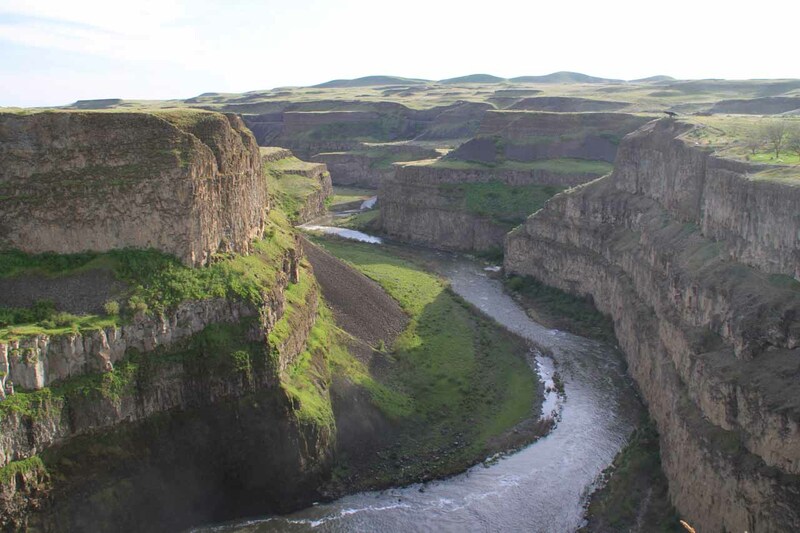 The accompanying canyons and hills surrounding both the falls and the deep gorge here provided clues as to violence of the geological forces at work from that last major Ice Age. 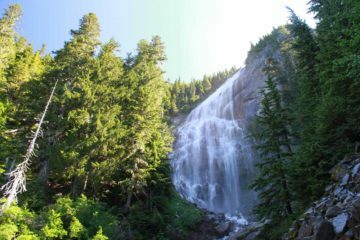 Indeed, we gave this waterfall the benefit of the doubt both in its ratings and in its place on our Top 10 US Waterfalls List. 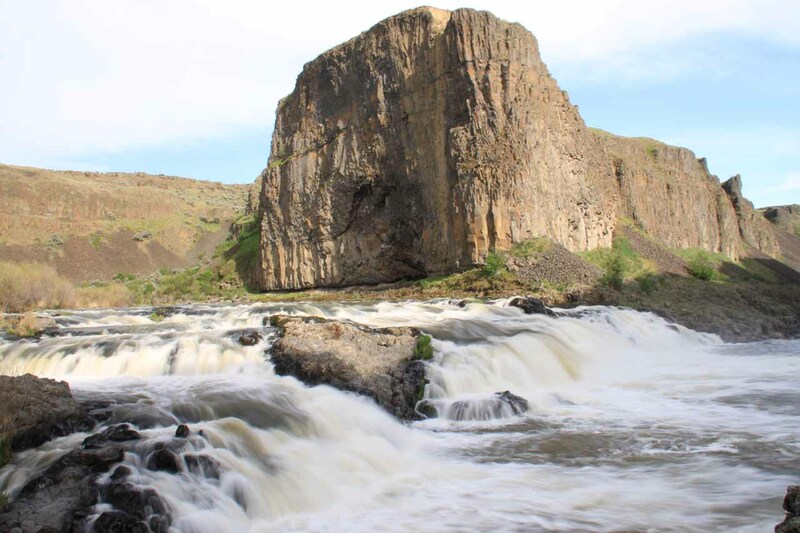 Perhaps it was also because we were starting to get jaded after seeing potentially larger waterfalls that ended up getting compromised in the Snake River Plains of Southern Idaho. 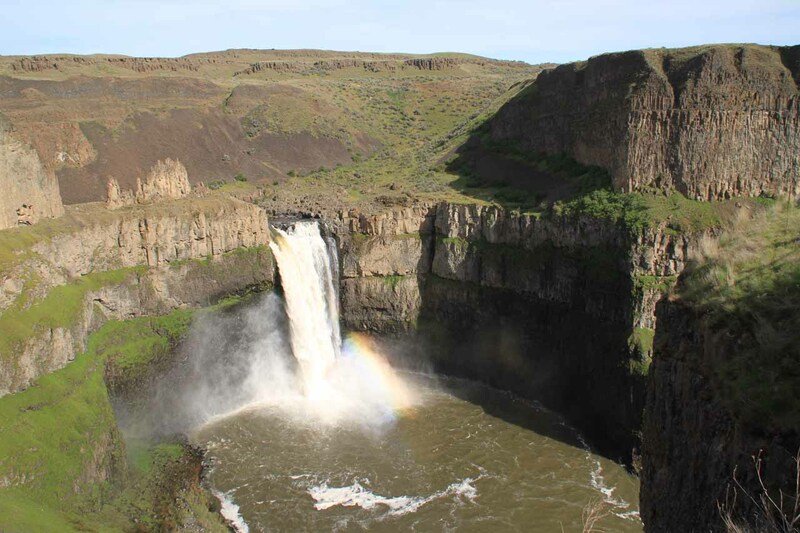 However, Palouse Falls was such a refreshing sight that it literally stole the show on our Idaho trip in April 2013. We had read in the literature this preservation was aided in part by a majority of ratepayers of Franklin County rejecting a proposal to build a dam immediately upstream of the falls despite the promise of lower rates. We were able to experience this waterfall in a few ways. We’ll describe these options separately on this page. 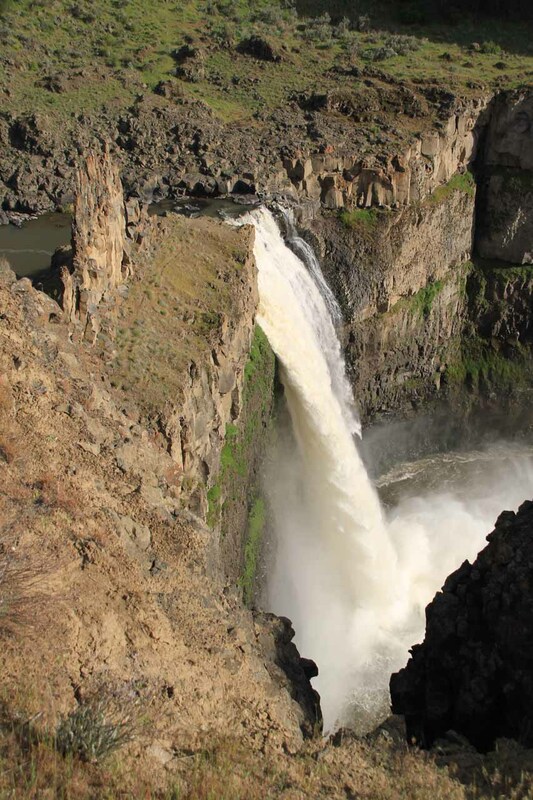 Even though this waterfall exhibited power and precipitous gorges, it was hard to believe that someone managed to kayak over this falls and still live! 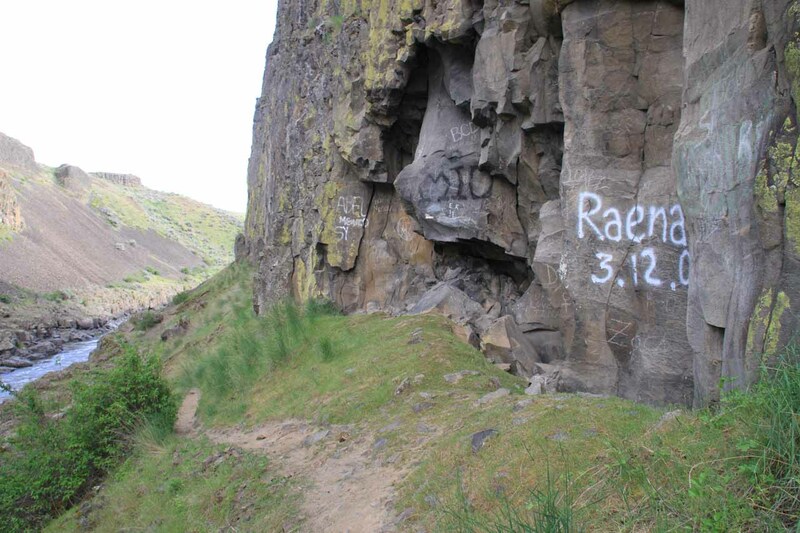 This happened back in April 2009, and I’m sure you can find YouTube videos of the feat if you do a search for “Palouse Falls kayak”. 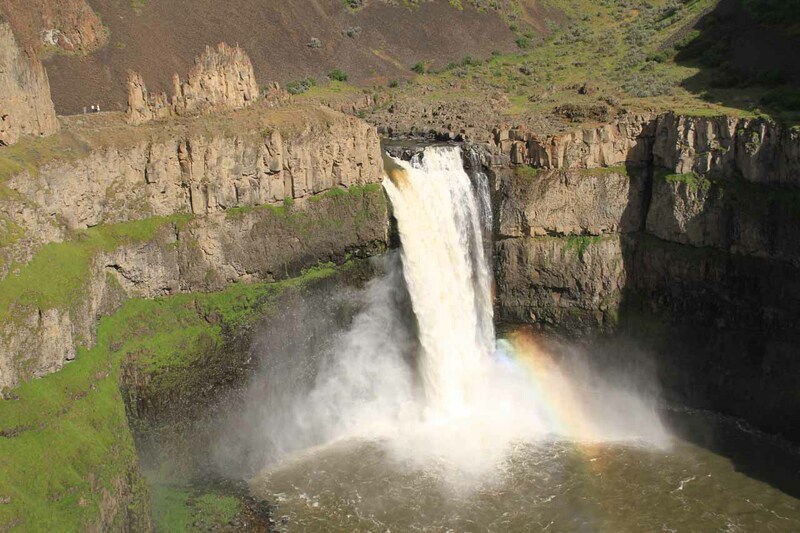 Since there were a few very different ways to experience the falls, I’ve decided to describe each method separately so we can paint a clearer picture for you about the experience and the logistics of a visit to Palouse Falls. All of the methods being described start and end at the main car park. See below. 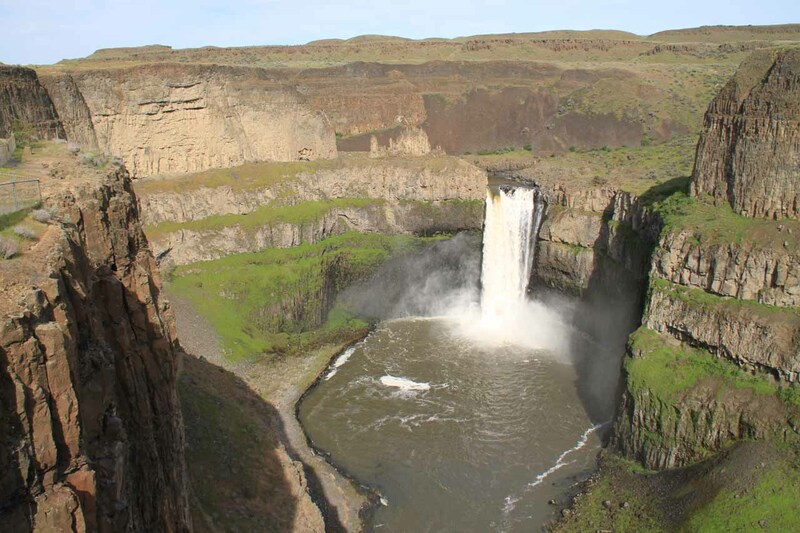 As for getting to the Palouse Falls State Park, see the directions further down the page. 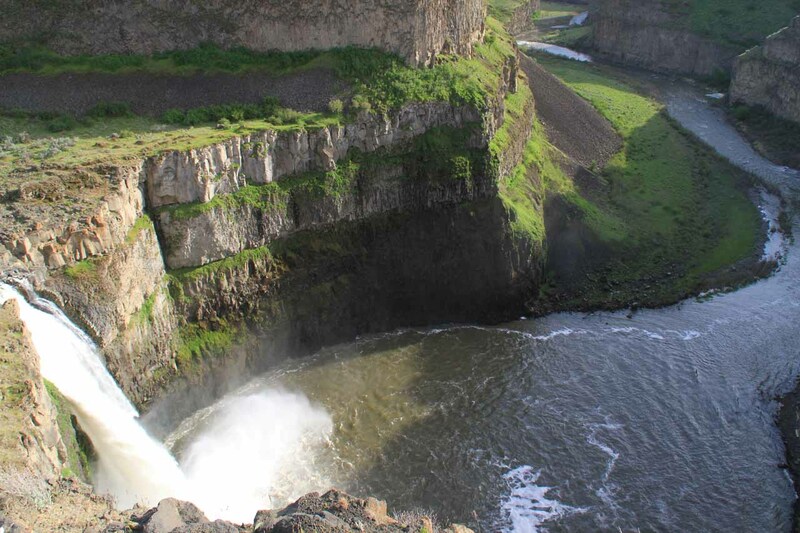 The main overlook was probably the most obvious way to experience Palouse Falls. 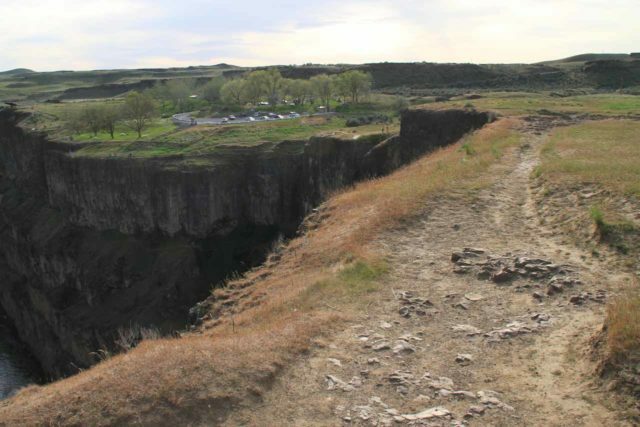 It was merely a few paces down two flights of steps past some lawn area with a few picnic tables to a broad overlook perched atop the rim of the deep gorge directly across from the falls. Fences were erected to keep us from getting too close to the edge. If we had only intended to just view the falls from here, our visit could’ve easily taken as little as 15 minutes or so. 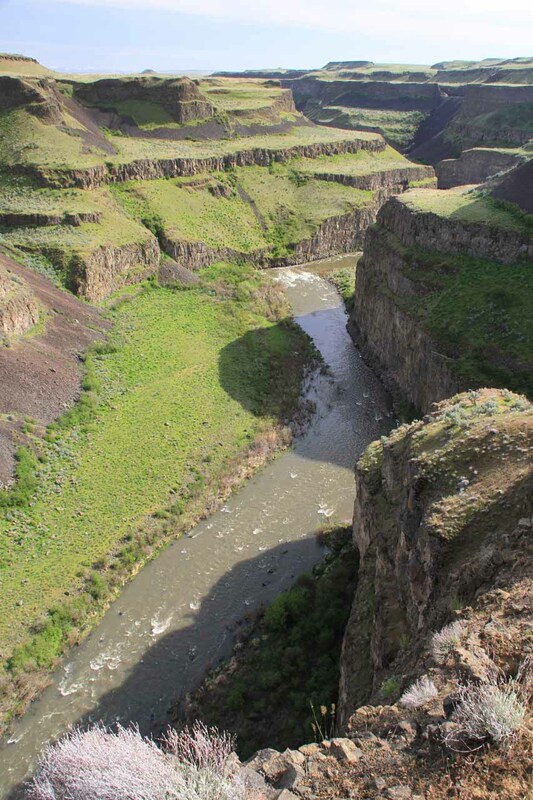 However, the overlooks along this part of the gorge rim was wide enough that we were able to get some different perspectives of the thundering falls as well as the attractive gorge further downstream. The immediate viewpoint from the base of the steps that connected with the car park yielded the most frontal view of the falls. Given its close proximity to the car park, this was also the busiest place to view the falls as we were sharing the overlook with photographers wielding tripods, a school bus full of young adults, and the dozens of visitors who came to behold the scenery before them. 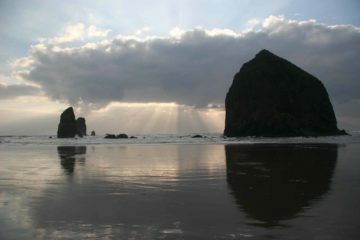 During our visit in the early afternoon, we happened to see half rainbows arcing across its base from this busy overlook. As we walked further to the right downstream of the falls, we were able to get views from slightly higher and different vantage points. The further away from the main overlook we were, the fewer people there were. 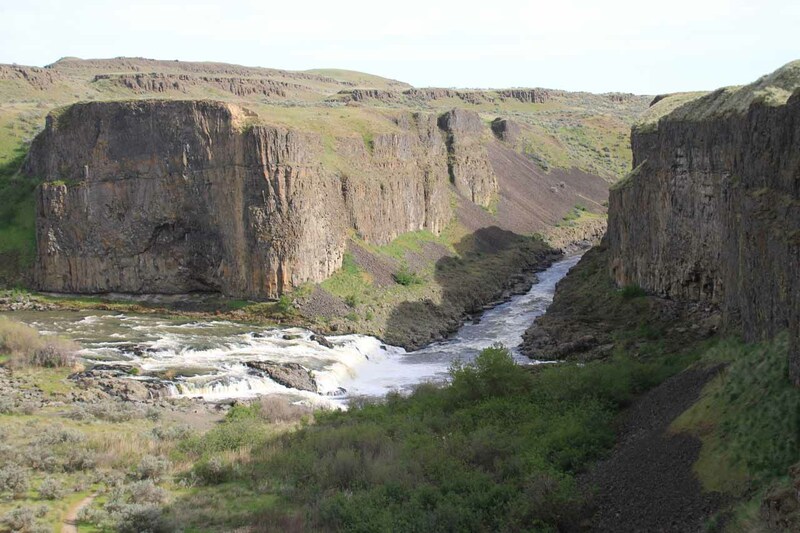 We went as far as the Fryxell Overlook, which was the sheltered overlook providing us with a somewhat distant and unusual perspective of Palouse Falls as well as a different look at the canyon further downstream when we looked away from the falls. 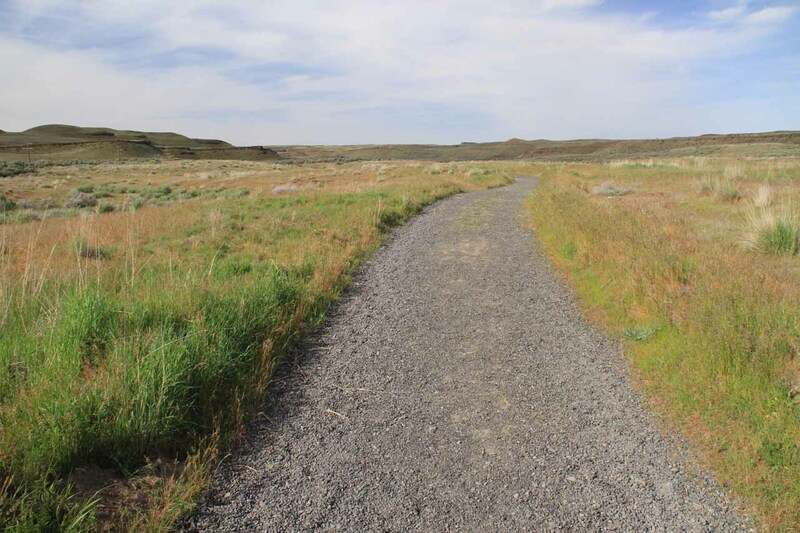 The reason why this sheltered overlook was given its name was because an anthropologist named Roald Fryxell from Washington State University happened to find bones and artifacts that were dated to be 10,000 to 12,000 years old! Finally, on my way to the Fryxell Overlook from the main viewing area, I noticed there was a locked gate that led to a steep descent down a crevice between a couple of the fenced overlooks. 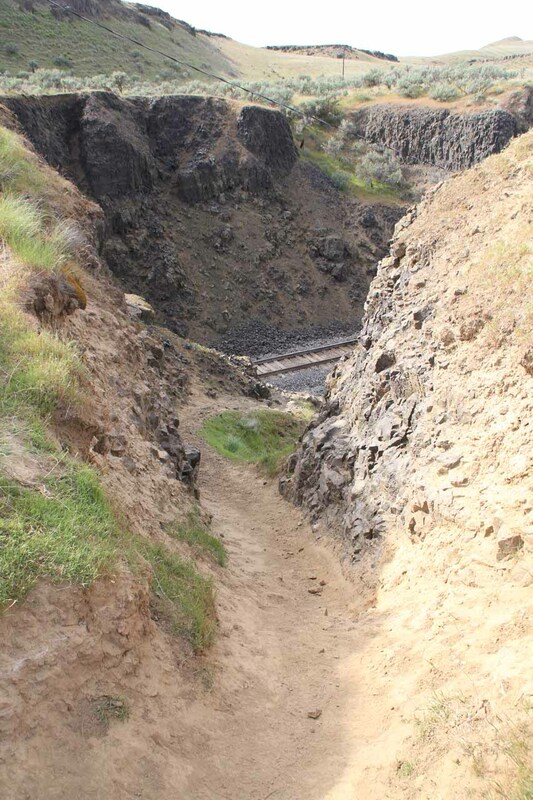 I (like almost everyone here) didn’t hop the gate to go down this path, but I was told by a couple who did manage to do this that the path ultimately led to the base of Palouse Falls. 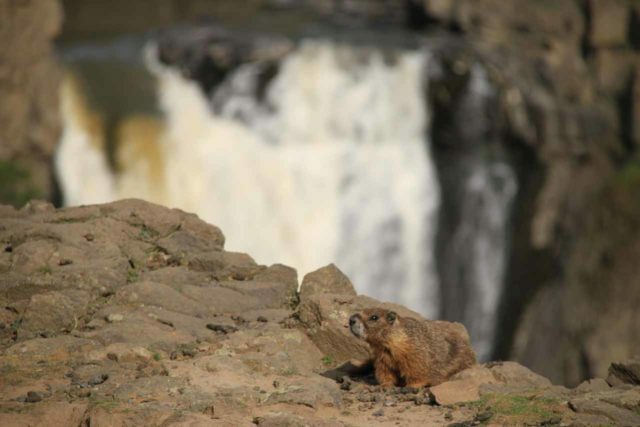 They said it wasn’t easy as much of the path had severe drop off exposure as it was sandwiched on a ledge between two cliffs before making its final descent to the Palouse River. What I’m calling the “top down views” pertained to a series of unfenced overlooks atop the cliffs immediately to the left of the falls as I faced it. I definitely had to exercise caution as the cliff exposure here made my butterflies in my stomach act up. The benefit of seeing the falls from this perspective was to see it at a more edge-on angle. Just to give you an idea of the photographic possibilities along these cliffs, I recalled seeing one photo in the literature where someone used an ultra-wide fish eye lens to capture both the falls and the canyon downstream. 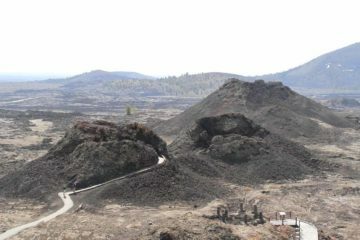 To access these overlooks, I left the car park just opposite the restroom facility along a gravel road. Shortly after descending then ascending a short gully, I then followed the informal footpaths on the opposite side of the gully. 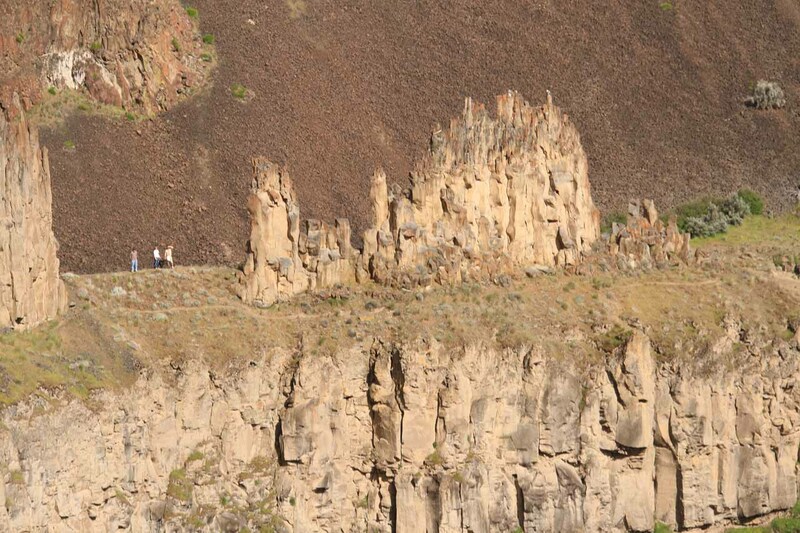 These informal footpaths eventually converged and skirted the canyon rim with very precipitous views of Palouse Falls. The footpaths continued onto a very precarious corner where I was able to get a very edge-on view of both the falls and the pinnacles (or “mohawk” as one person put it). I definitely had to exercise extreme caution here because there were drop offs all around me and the terrain sloped towards the drop offs. 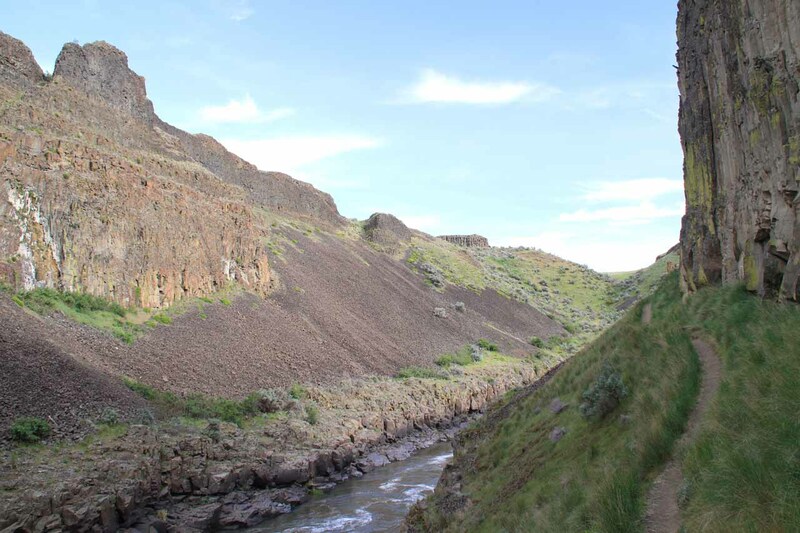 The informal footpaths continued further along the canyon rim upstream of the main falls. I continued along these cliffs as I started to glimpse a very top down view of the much smaller Upper Palouse Falls with its very wide 20ft drop. Despite some false trails and small water pipes going along into some gullies, there was no immediate way down the cliffs to access the falls from the informal footpaths. I’ll describe how to get down there through the next method of experience Palouse Falls below. 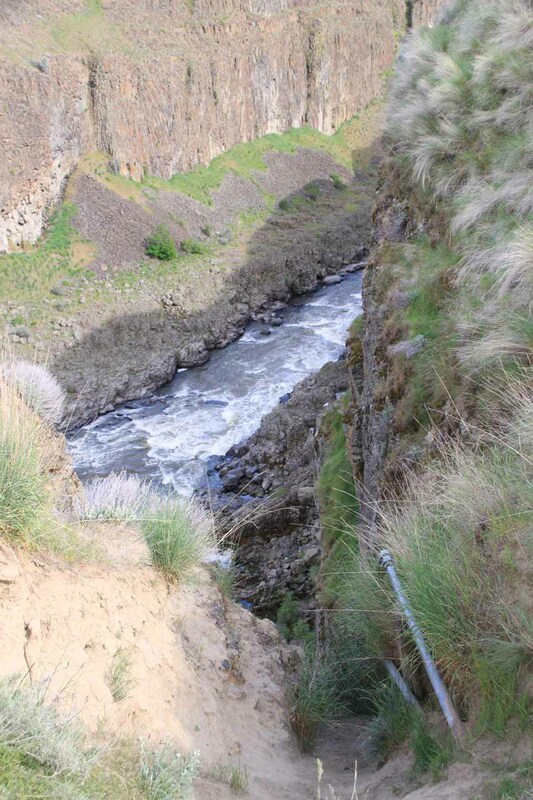 There were a couple of ways to reach the trail that led down to the Upper Palouse Falls. 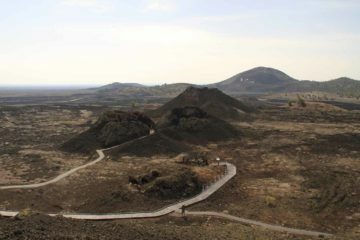 The most straightforward way I did it was to follow the gravel path directly opposite the restrooms at the car park, and walk to the end of the gravel road. There was a power line near the end. From there, I headed towards the edge of the canyon rim on the right and looked for a steep scrambling path down to some railroad tracks. 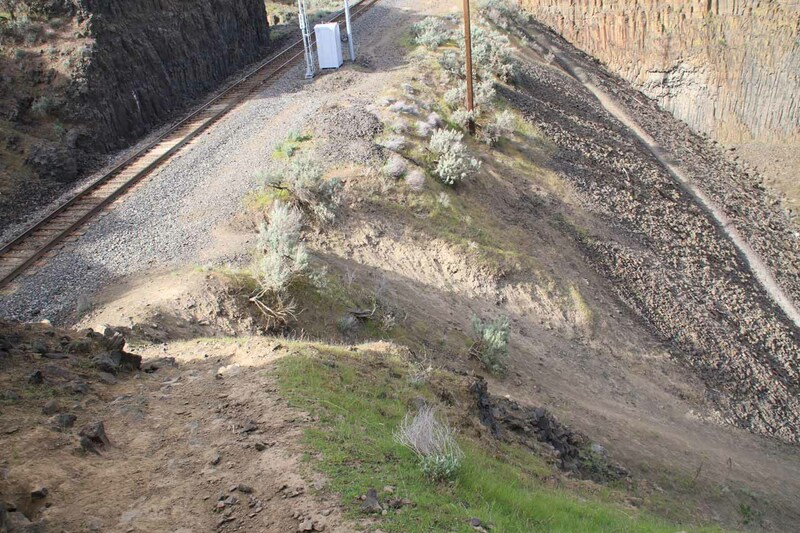 Alternatively, instead of the gravel road, I could have taken the informal footpaths along the canyon rim (as described for the top down views and taken that footpath all the way to the railroad tracks access. To get down to those tracks, I definitely made good use of the traction on my hiking boots because the path leading down there was definitely steep and potentially slippery though very doable with care. Once I was besides the railroad tracks, I walked towards the end of the tracks where there was a foot trail on loose but stable rocks that ultimately descended into the base of the canyon. A sign at the base of this descent reassured me that this was indeed a sanctioned trail. 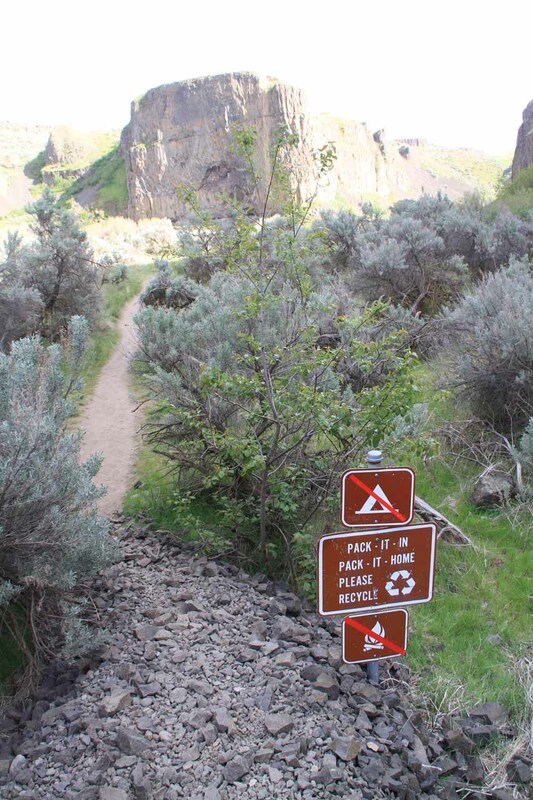 Beyond the sign, the trail led me through some vegetation towards the base of the Upper Palouse Falls. Even though this falls wasn’t tall, it was attractively wide and it was backed by a scenic rounded butte so I had some fun trying to compose photographs involving all the scenic subjects. 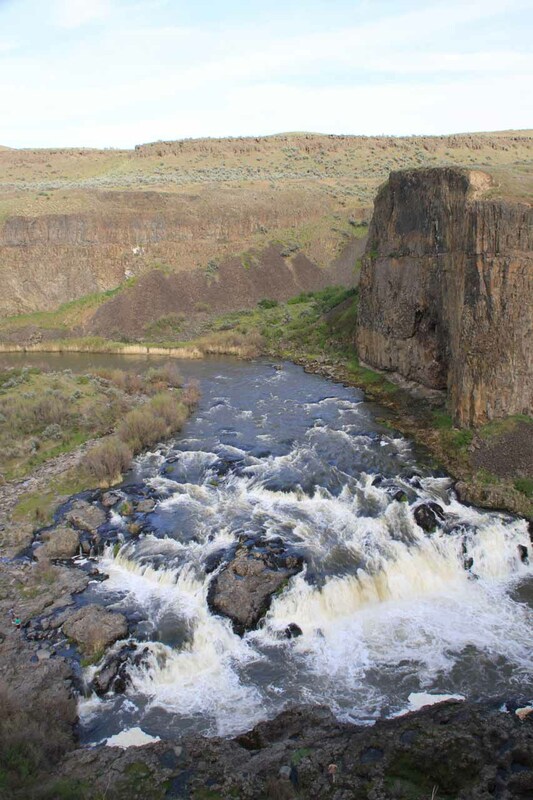 The trail continued further downstream of the upper falls as it followed a ledge between the Palouse River and the graffiti-laden cliffs. 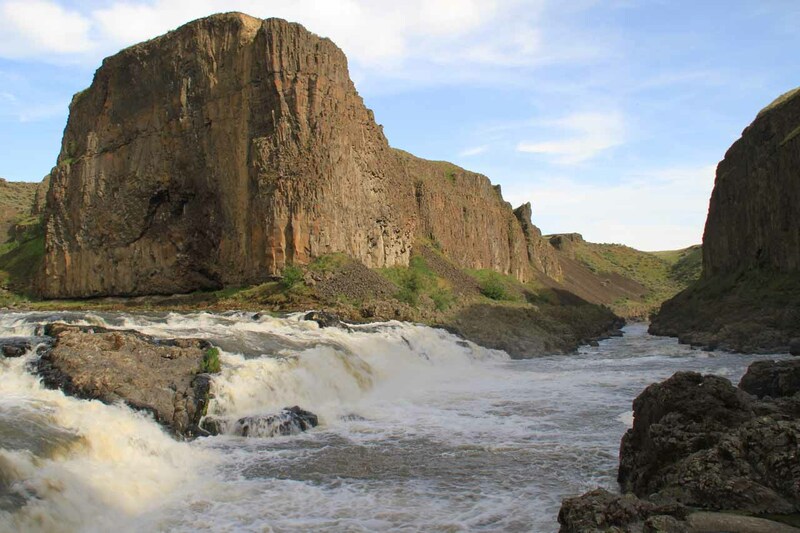 After about a quarter-mile, I found myself scrambling behind the “mohawk” that was immediately above the top of the main Palouse Falls. Even though the view of the falls from here wasn’t satisfactory (it was mostly blocked by cliffs, and I had to get precariously close to the edge in order to even get a partial view of the falls), the thrill and exhiliration of literally being at the top of the falls was what really made this hike. In addition, I’m sure I was also someone’s photographic subject since I would’ve been seen by onlookers on the opposite side of the canyon at the main overlook area. This was my turnaround point as I headed back the way I came. 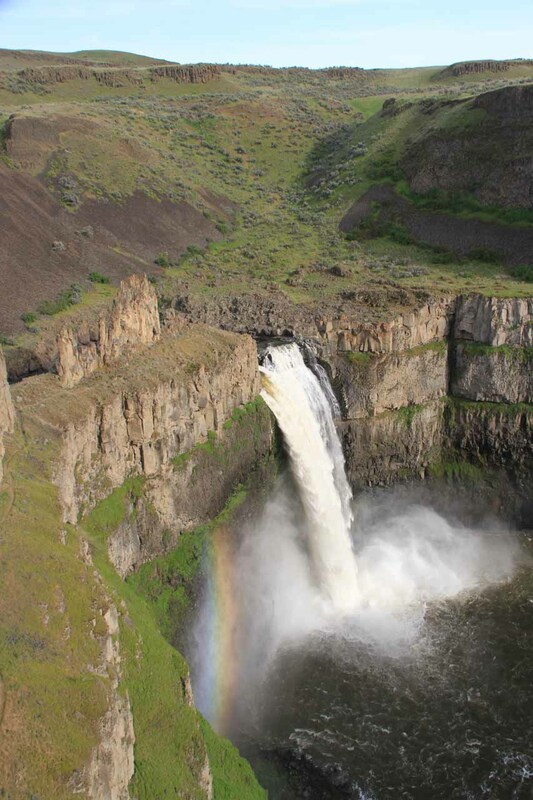 In our long drive to Palouse Falls State Park, we started from the town of Walla Walla, Washington, which we thought was the closest town of any significant size to the falls (though Pullman, Washington of Washington State University fame also seemed to be similar in distance). 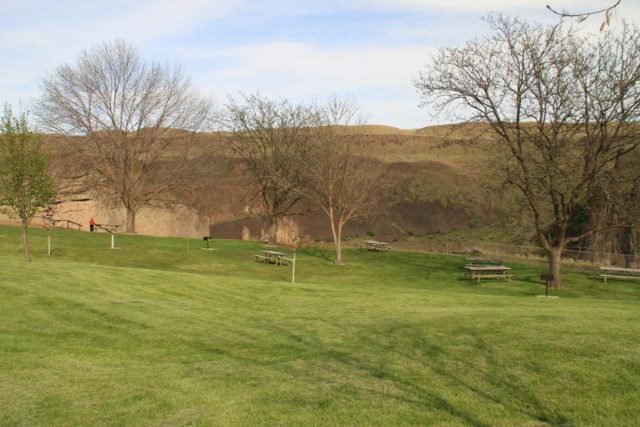 From Walla Walla, we drove about 44 miles north on the US12 before turning left onto Hwy 261. 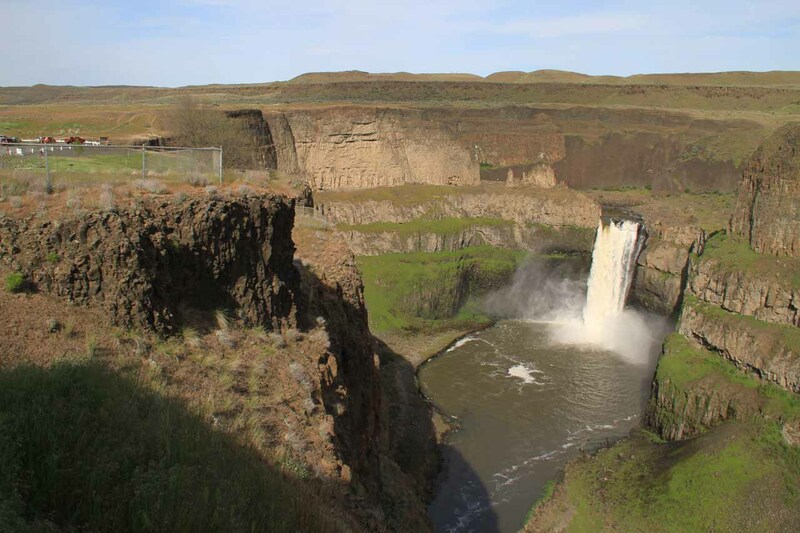 We’d follow Hwy 261 for the next 23 miles until we reached the signposted turnoff for Palouse Falls State Park on our right. At that point, the road was unpaved and we drove the last 2.3 miles to the end of the road where there was the car park. This drive took us about 90 minutes (3 hours round trip). There was a $10 day use fee collected from drop envelopes on an honor system. The fee envelopes were said to be collected on a daily basis. Walla Walla was about a 253-mile 4-hour drive from Boise, Idaho. 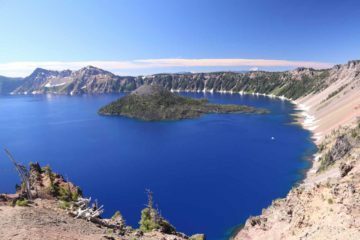 Spokane, Washington might be more of a closer city if you’re planning a road trip to this area as it was 180 miles or 3 hours drive. 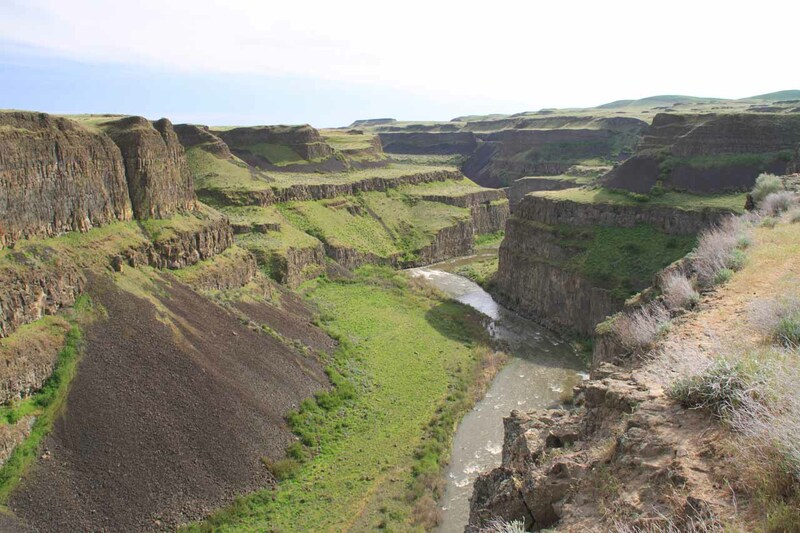 Left to right sweep starting with a zoom-in of the railroad in the distance, then panning across the Upper Palouse Falls and the butte backing it before showing the downstream gorge scenery. 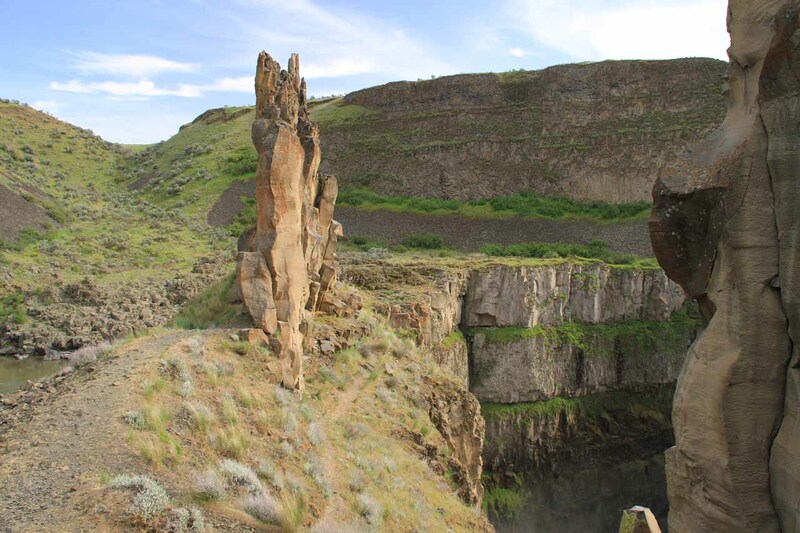 The movie ends with a contextual fixation on the falls and butte together.